The National Grid is the high-voltage electric power transmission network in Great Britain, connecting power stations and major substations and ensuring that electricity generated anywhere in England, Scotland and Wales can be used to satisfy demand elsewhere. 1927 The Central Electricity Board was established a statutory body (but not a Government department). Its main purposed was to organize the construction of the "Grid", for which purpose the country was divided into ten main areas, namely: North Scotland, Central Scotland, South Scotland, North- East England, North-West England and North Wales, Mid-East England, Central England, East England, South-East England, and South-West England and South Wales. For each of these areas, except North Scotland, regional schemes were designed so that they would dovetail into each other. 1928 Construction began in Central Scotland early in 1928, and the last tower for the main transmission system was erected on the outskirts of the New Forest at the beginning of September, 1933. 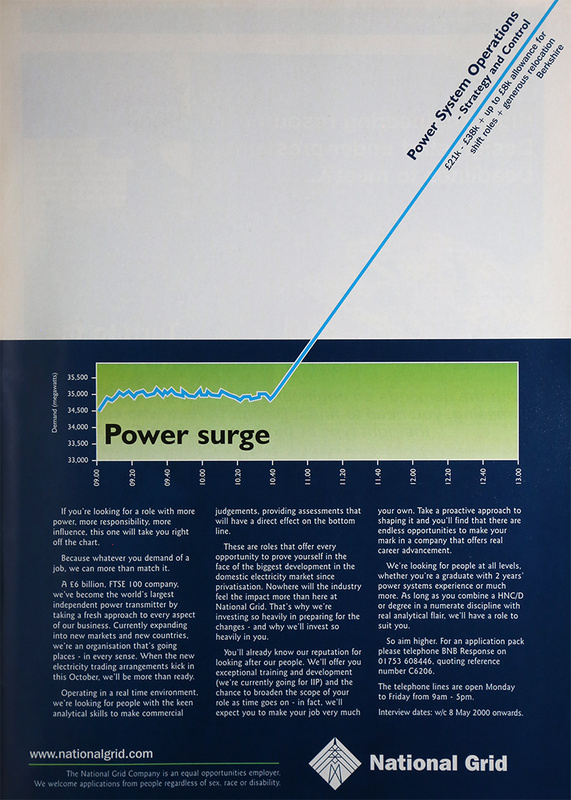 In total there were 4,000 miles of transmission lines, including 2,894 miles of primary lines operating at 132 kvolts, and 1,106 miles of secondary lines operating at lower voltages. The primary lines included 15 route miles of cable and the secondary lines, 102 route miles of cable laid within the London area. In the system there were 26,265 towers, averaging 75 feet in height and over three tons in weight. Approximately 60 rivers had to be crossed, involving the construction of special towers of varying height. The largest towers in the Grid were those for the Thames crossing at Dagenham. They were 487 feet high and weighed 290 tons each. The span of the conductors between the towers was 3,060 feet. Other tall towers were for crossing the Forth at Kincardine, the River Roding at Barking Creek, the Severn crossing at Upper Arlingham, and the Clyde crossing at Yoker. 1990 On the breakup of the CEGB, the ownership and operation of the National Grid in England and Wales passed to National Grid Company plc, later to become National Grid Transco, and now National Grid plc. In Scotland the grid split into two separate entities, one for southern and central Scotland and the other for northern Scotland, connected by interconnectors to each other. The first is owned and maintained by SP Energy Networks, a subsidiary of Scottish Power, and the other by SSE. However, National Grid plc remains the System Operator for the whole UK Grid.